The Democratic Republic of Congo (DRC) is the largest country in sub-Saharan Africa. Between the 14th and 19th centuries, the kingdom of Kongo included much of the western part of present-day DRC, while in the centre and east the kingdoms of Luba and Lunda ruled from the 16th and 17th to the 19th centuries. The region was made a personal colony of the Belgian King Leopold II in 1885, called the Congo Free State, and exploited for its natural resources, particularly rubber, through plantation agriculture using forced labour. During this time a large proportion of the Congolese population died as a result of exploitation and disease. Belgium annexed the territory as the Belgian Congo in 1908. Independence was gained in 1960 as the Republic of Congo, also known as Congo-Leopoldville; this was later changed to Zaire in 1971 and the Democratic Republic of the Congo in 1997. Since independence, the DRC has experienced extensive political, civil and military conflict, including civil wars, involvement in conflict in neighbouring countries, coup d’etats, and widespread internal unrest. The Second Congo War, from 1998 to 2003, has been called the deadliest global conflict since the Second World War, killing between 2.5 and 5.5 million people and involving nine countries. The official end to this conflict did not end unrest or instability. Human rights organisations warn that political unrest in 2016 and 2017 has sparked a new rise in conflict that risks spreading across the country again. The DRC has one of the lowest GDPs per capita in the world. It has vast mineral resources, including cobalt, diamonds, copper, gold, uranium and oil, which generated up to 70% of export revenue in the 1970s and 80s. However, revenues are vulnerable to price fluctuations in global markets, and foreign investment in the mining industry is hard to attract in the climate of instability and poor infrastructure. Control over natural, especially mineral, resources has played a part in conflict, and a large proportion of DRC’s mineral exports is thought to be illegally traded. Small scale artisanal mining is also important to the informal economy. The dense forest that covers much of the country is a rich timber resource, but, along with very poor infrastructure, also impedes transportation. The DRC obtains electricity from hydroelectric stations on the Congo River, as well as some coal and oil. Subsistence agriculture supports most of the population; commercial plantation is beginning to expand again after declining during the Congo wars, and supports key the export crops of coffee and rubber. With high rainfall and major perennial rivers, the DRC is a water-rich country, but water supply infrastructure is poor. Despite the abundance of surface waters, the vast majority of the population is dependent on groundwater for water supplies, especially from springs, which provide the main source of drinking water for up to 90% of the rural population. Please cite this page as: Chishugi, Birikomo, Upton, Ó Dochartaigh and Bellwood-Howard, 2018. The central part of the country is a large basin ranging in altitude from 350 to 700 m above sea level, with broad steep-sided valleys. To the east of this basin is a mountain ridge from 2300 to 3800 m above sea level that marks the edge of the East African Rift. To the south are the high Kasai and Shaba plateaus, from 1000 to 2000m above sea level. To the west are the Mayumbe hills, around 750 m in elevation, with narrow cols and valleys. To the north the basin is bounded by the watershed of the Oubangui river. The coastal area in the west, on the Atlantic Ocean, contains largely low land and sandy beaches, or cliffs. The Democratic Republic of the Congo lies on the equator. Average temperatures across much of the country are around 25 degrees C, except in the eastern mountains where average temperatures are around 20 degrees C. There is much cloud cover over much of the year, with the maximum sunshine in the dry season. Average annual rainfall for the whole country is over 1,200 mm, rising to more than 2,000 mm in the central basin, and falling to a minimum of around 850 mm at the western coast. There is a single rainy season, from September to June in the south and from February to November in the north; and a single dry season, in June and July in the south and December and January in the north. 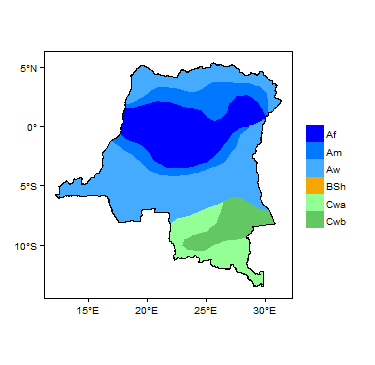 More information on average rainfall and temperature for each of the climate zones in Democratic Republic of the Congo can be seen at the Democratic Republic of the Congo climate page. The Congo River is the largest river basin in Africa, and the second largest in the world after the Amazon, and drains all surface water in the country. It has a number of large tributary rivers, many of which have been dammed for hydroelectric power production. 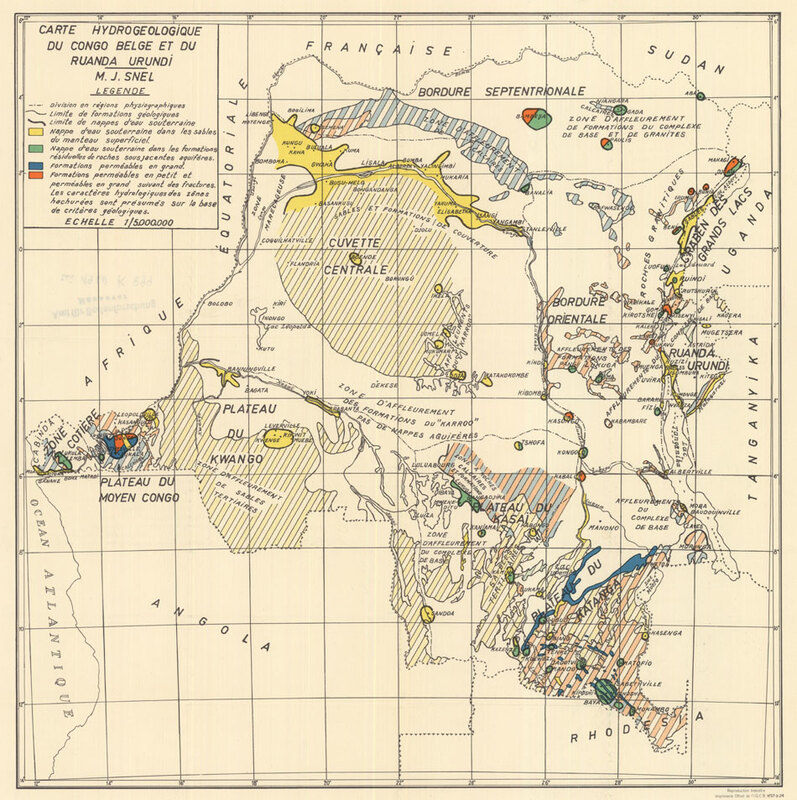 This section provides a geological map and a summary of the geology of the Democratic Republic of the Congo at a national scale, based on a 1:5 million scale map (see the Geology resources page for more details). A UN report (1989) with information current at the end of the 1980s. A lithological map of the DRC, developed by the World Soil Information (ISRIC) as part of developing a Soil and Terrain Database (SOTER) for Central Africa. The lithological classes in SOTER are based on a geological map of the Congo at 1 : 2 million scale compiled by the Musée Royal d'Afrique Centrale (MRAC) (Lepersonne 1974). The SOTER database also includes data on landforms and hydrographic networks. The lithological classes are described in van Engelen et al. 2006. The lithological map is available as a GIS shapefile. The 1974 geological map of the DRC (Lepersonne 1974) was recently updated (2015) by the Musée Royal d'Afrique Centrale (MRAC) in Belgium, on behalf of the DRC Ministry of Mines, as part of the World Bank-funded PROMINES project (Fernandez-Alonso 2015). This map is not publicly available. It shows no changes in lithological contours from older geological maps. It did redefine the chronostratigraphical and lithostratigraphical divisions at Supergroup and Complex level, and reallocate the geological units represented according to the new definitions. 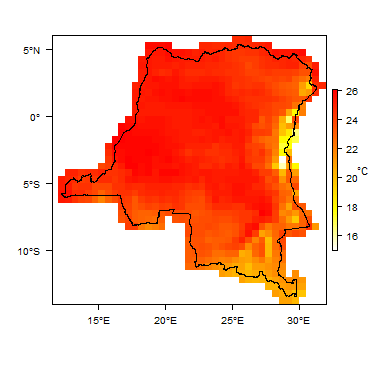 The youngest sediments in the DR Congo are various sequences of largely unconsolidated Tertiary to Quaternary sediments, which cover much of the country. They include river valley alluvium, lateritic gravels and lacustrine deposits. There are also small areas of Quaternary volcanic rocks in the far east, associated with the East African Rift. Below these in many areas are a series of unmetamorphosed and largely undeformed sedimentary rocks, ranging in age from Palaeozoic (largely Upper Carboniferous) to Cretaceous. The oldest rocks in the country are Precambrian in age, of various types including metasedimentary rocks and crystalline granitic and metamorphic basement rocks, all variously deformed. Alluvium, lacustrine, aeolian, lateritic and other unconsolidated deposits Tertiary to Quaternary Fine to coarse sands and gravels; clays and sandy clays. In some areas, such as underlying the Batékés Plateau and southeast Kasaï, the sediments consist mainly of semi-continuous sandy loam and soft sandstone (Partow 2011). Well-consolidated sandstones and argillaceous rocks Jurassic to Upper Carboniferous Karoo-type sandstones, and in some cases calcareous rocks. Metasedimentary rocks Precambrian Metamorphosed quartzites, schists, limestones, dolomitic limestones and dolomites. The calcareous rocks are often karstic. 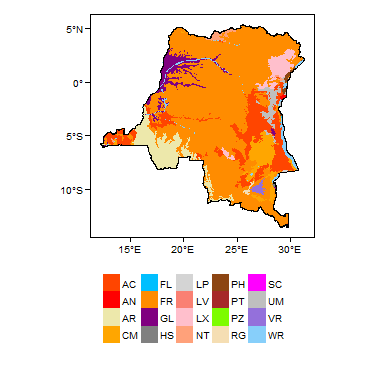 This section provides a summary of the hydrogeology of the main aquifers in the Democratic Republic of the Congo at a national scale. More information is available in the references listed at the bottom of this page. Many of these references can be accessed through the Africa Groundwater Literature Archive. The DRC is also covered by the SADC hydrogeological map and atlas (2010), available through the SADC Groundwater Information Portal. To date, there has been no systematic hydrogeological exploration in the DR Congo. Some hydrogeological data have been collected in particular regions of the country, by various agencies - including REGIDESO (Regie de Distribution d'Eau de la Republique Democratique du Congo - the national water supply and sanitation agency), NGOs and mining companies. A number of reports have been published since the 1950s that describe aspects of the hydrogeology of the DRC. Although they provide much essential information, they all suffer from a lack of field data from hydrogeological tests (e.g. borehole pumping tests). In 1957, Snel presented the first country-scale general hydrogeological overview, and compiled a hydrogeological map (available to view as a scanned image from the BGR WHYMAP website). Though the report is very rich and descriptive, it does not include any quantitative data on aquifer characterisation. 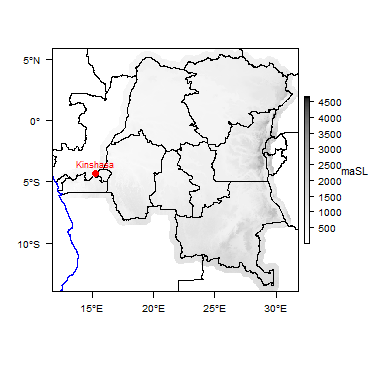 Waleffe (1985) provided an outline of the hydrogeology of the lower Rusizi aquifer, which was later re-interpreted by Hakiza (2002), who provided some values for aquifer parameters for the lower Rusizi to the north of Lake Tanganyika, including on the DRC side of the border. During the 1980s there was groundwater research in several areas, with a view to developing drinking water supplies for key urban areas. This included the central sedimentary aquifer basin (e.g. Boende, Lisala and Basankusu) and areas where Precambrian formations are dominated by limestones (e.g. Mbanza-Ngungu, Likasi and Lubumbashi). Results from this research are summarised in a United Nations report (1989). A Nile project report (2010) presents a summary of Snel (1957) with some additional aquifer properties data from an unknown source. Although widespread, these data are still not representative of the whole country. 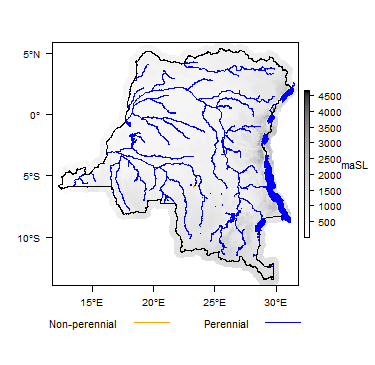 The most recent publication describing the hydrogeology of the DRC is by UNEP (Partow 2011), which includes a review of existing literature and information. At a regional scale, only the hydrogeology of the Katanga province has been extensively studied, due to intensive mining activities in these regions. There is also some dispersed hydrogeological data for other mining sites, including the Kibali Gold Mine (Watsa), Mongualu (Oriental Province) and Banro (South Kivu). Most of the Quaternary and Tertiary sediments are unconsolidated, but in some areas they form weakly consolidated sandstone. The Cretaceous rocks form consolidated sandstones. All are dominated by intergranular flow. 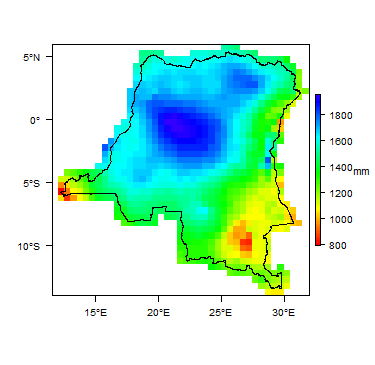 Continuous thick aquifers, particularly in the Cuvette Centrale and Oubangui areas. High Comprised of largely coarse-grained alluvial sands and gravels, which can reach up to 120 m thick. Recharge is high, coming both from direct rainfall infiltration and indirectly from river infiltration. Areas which are known to have particularly good potential include Libenge and the alluvial plain between the N’Djili River and Ngaliema Bay in Kinshasa (Partow 2011). Transmissivity values from borehole test pumping are often 10 to 200 m2/day, with borehole yields of 0.2 to 0.6 l/s (15 to 50 m3day). Transmissivity values of 40 to 300 m2/day, and individual borehole yields of 0.05 to 0.3 l/s (5 to 25 m3day) are recorded from test pumping boreholes in various unconsolidated aquifers, mostly in the central basin. Thinner and/or less continuous unconsolidated sediments; Quaternary-Tertiary aquifer in Batékés Plateau and southeast Kasaï Variable - Low to High Away from the Cuvette Centrale and Oubangui areas, outcrops of unconsolidated sediments - including alluvium, laterite gravels, aeolian sands and other deposits - have variable aquifer properties, depending on their lithology, depositional history, thickness and lateral extent. Thick sediments dominated by sand and gravel can form highly productive aquifers, but finer grained and/or thinner sediments tend to form low to moderate productivity aquifers. Wellfields of boreholes in unconsolidated sands and gravels, between 5 and 15 m thick, recorded total specific capacity values of 1 to 100 m³/hour/m (United Nations 1989). The Tertiary-Quaternary aquifer in the Batékés Plateau and southeast Kasaï areas consists mainly of semi-continuous sandy loam and soft sandstone, is up to 100 m thick. It has relatively low productivity, with transmissivity values from test pumping generally less than 50 m2/day, and borehole yields usually less than 0.01 l/s, sometimes up to 0.5 l/s (1 to 45 m3day). However, it sustains many streams by baseflow. Recharge is largely from direct rainfall infiltration, with limited local river bed infiltration. Cretaceous sandstones Low to Moderate A 160 m deep borehole in soft Cretaceous sandstones, which had layers of argillaceous (clay and/or silt rich) material, recorded a specific yield value of 4 m³/hour/m of drawdown; a transmissivity value of 130 m²/day, and a storage coefficient of 6.5 x 10-4 (United Nations 1989). Other boreholes in Cretaceous sandstone have shown yields of ~0.1 l/s (7 to 11 m3/d), with transmissivity values of 100 to 130 m2/day. Groundwater in the Cretaceous sandstones is likely to be low in dissolved solids and minerals (Partow 2011). Pollution due to anthropogenic activities is reported in some areas. Recharge is largely from direct rainfall infiltration and locally from riverbed infiltration. Mesozoic-Palaeozoic sandstones Low to Moderate Mesozoic Karoo-type sandstone and calcareous aquifers occur in large parts of the Cuvette Centrale, including around Gemena, Kisingani and northern Kasaï. They typically have low to moderate productivity. Both intergranular and fracture flow are important, and in some areas fracturing has led to the development of karstic systems, which have higher productivity (Partow 2011). Recharge is largely from direct rainfall infiltration and locally from riverbed infiltration. and can be rapid, especially via large fractures and karstic features. Groundwater is likely to be low in dissolved solids and minerals (Partow 2011). Pollution due to anthropogenic activities is also reported. Metamorphosed limestones and dolomitic limestones, including the Lubumbashi dolomites; quartzites and other non-calcareous rocks Variable - Low to High Karstic metamorphosed limestones and dolomitic limestones can form highly productive aquifers, sometimes with well-developed karstic flow, such as the Lubumbashi dolomites in southern Katanga (Partow 2011). Boreholes up to 150 m deep are recorded, with specific capacity values of 3 to 11 m³/hour/m; transmissivity values of 130 to 140m²/day, and a storage coefficient of 0.3 x 10-5 (United Nations 1989). Non-karstic Precambrian metasedimentary rocks typically form low productivity aquifers, possibly locally moderately productive where there is extensive fracturing. Borehole yields of between 0.01 and 1 l/s (0.5 to 90 m3/day) are reecorded, and transmissivity values of 0.03 to 50 (very occasionally higher than 50) m2/day. Karstic and carbonate aquifers have alkaline groundwater. Where there are sulphide minerals in the rock, as in some schists, or in gypsum, as found at Katanga, groundwater can be highly mineralised (Partow 2011), making groundwater quality poor in some areas. Water contamination due to mining activities is mapped and reported at some sites. Recharge is largely from direct rainfall infiltration. Precambrian Basement and Metasedimentary Low to Moderate Crystalline basement rocks and highly metamorphosed metasediments and metavolcanic rocks form local aquifers where they have developed weathered and/or fractured zones. These usually have low productivity, but occasionally moderate. Transmissivity values of 1 to 50 m2/day, and rarely up to 100 m2/day, have been recorded, and yields of 0.2 to 1.7, and rarely up to 3.5, l/s (20 to 150 (rarely up to 300) m3/day). Aquifer properties are controlled by the depth of weathering (regolith) and the degree of fracturing of un-weathered bedrock. Fractured bedrock alone can sometimes supply relatively good yields, but has low storage and cannot sustain these yields in the long term. Weathered regolith (which is up to 30 m thick in the oriental provinces) can provide additional storage. In Oriental Province (see Kibali and Mongwalu lithology), three main aquifers have been identified in the Precambrian Basement in the Watsa area: an unconfined aquifer in the overburden, and two confined aquifers: the first at the interface between the saprolite/clay and the fresh rock, the second in fractures in the fresh rock. The former was under a silty clay formation (with variable thickness 0 -30 m) partially saturated with water. Water is struck in the interface aquifer at variable depth (>30 m). The rest water level was subsequently measured few meters above the top of the first aquifer, and, in some cases, at few meters below ground surface. Several boreholes in the Kibali mine perimeter supply valuable data for the hydrogeological investigation in this area. Groundwater in the basement aquifer typically has naturally low levels of mineralisation and a below-neutral pH (Partow 2011), unless impacted by mining. There is little information on the extent and quality of groundwater resources, including springs, in the country. The data that are available are often outdated and of limited geographic coverage (Partow 2011). Water quality studies, both of surface and groundwater, have usually been done on an adhoc basis, as part of targeted research and academic projects. There are also some groundwater level and quality data from mining projects, including continuous records of monthly or quarterly data during mining operations. Mining-related data is mostly available for the Katanga, Oriental, Kivu and Maniema provinces. The available information gives no evidence of major groundwater quantity or quality deterioration across most of the country, but points to pressures on groundwater resources in some areas. Increasing water demand, combined in some cases with drought-prone areas, has led to increased seasonal falls in groundwater levels water shortages in some areas (Partow 2011). Groundwater (and surface water) quality deterioration from mining-related heavy metal pollution is a major issue of concern in a number of areas, including the Katanga Copperbelt, around the main gold mining centers in Ituri (including elevated concentrations of mercury, arsenic and cyanide), and locally around areas of artisanal gold processing (especially related to widespread use of mercury) (Partow 2011). Away from mining areas, the main source of groundwater pollution is biological contamination from uncontrolled sewage and solid waste disposal (Partow 2011). Most of the information in this section is taken from Partow (2011), who provides the most recent detailed overview of water issues in the country. Despite the abundance of surface waters, and the fact that up to date and accurate information on water use in the country is not available (Partow 2011), the vast majority (around 90%) of the population is thought to be dependent on groundwater for drinking water, mainly from springs (Partow 2011). These sources are mainly simple capped spring heads, and are used both in rural villages and in the rapidly growing peri-urban areas. Large-scale water production from springs through distribution networks is also an important water source for many cities, including Mbuji-Mayi, Lubumbashi, Kisingani, Bunia, Beni, Gemena and Lisala (Partow 2011). Groundwater is also abstracted from hand dug wells, using hand pumps or mechanical pumps. Groundwater from wells is estimated to account for approximately 10 percent of the country's drinking water supply (Partow 2011). Nile IWRM-Net (2007), Chishugi and Xu (2010) and Partow (2011) (see References, below) provide a detailed discussion of the water sector in the DRC, including responsible bodies and legislation and how these are changing. In general, water sector governance is structurally weak, characterised by a multiplicity of laws and institutions with often overlapping and conflicting mandates. The DRC lacks a clear water policy, a framework water law and a dedicated water ministry to guide and lead sustainable development of the sector. With the government reform initiative that begun in 2006 with the support of development partners, particularly the German Technical Cooperation’s (GTZ) water reform project (RESE), this situation may change. There is no national groundwater monitoring programme, either for springs or groundwater levels, or for groundwater quality. However, there are some data on groundwater sources for localised regions, held by several NGOs and mining companies, including in Katanga, South Kivu, North Kivu, Kasai and Oriental Provinces. A project is ongoing to compile a database of stratigraphic logs for water boreholes drilled into shallow aquifers. - the Western Rift Valley Sediment aquifer, shared with Uganda. The following provide more information on the geology and hydrogeology of the Democratic Republic of the Congo. Many of these, and others, can be accessed through the Africa Groundwater Literature Archive. Altchenko Y and Vilholth KG. 2013. Transboundary aquifer mapping and management in Africa: a harmonised approach. Hydrogeology Journal Vol.21, Issue 7, pp. 1497-1517. Cahen L. 1954. Géologie du Congo Belge, Ed. Liège Imprimerie H. Vaillant-Germanne, S.A. 4, Place Saint-Michel, 4. Hakiza G . 2002. Potentialites Aquiferes de La Plaine de La Rusizi (au Nord du Lac Tanganyika). Lepersonne L. 1974. Carte Géologique du Zaïre (scale 1:2,000,000). Musee Royale de l’Afrique Centrale et Institut Geographique Militaire, Brussels. Ndembo J. 2009. Apport des outils Hydrogéochimiques et Isotopiques à la gestion de l’Aquifère du Mont AMBA (République Démocratique du Congo). Thèse, Université d’Avignon et des Pays de Vaucluse. pp. 203. Nile IWRM-Net. 2007. Capacity Building Actions in Groundwater Management Issues as an Aspect of IWRM for the Nile Region. Short term Consultancy Report. Passau G. 1923. La geologie du bassin de schistes bitumineux de Stanleyville (Congo belge). Annals de la Societe geologique de Belgique, Publications Relatives au Congo Belge et aux Regions Voisines. Annee 1921-1922: Annexe au tome XLV des Annales. Liege. Schlüter T. 2006. Geological Atlas of Africa. Springer, Berlin-Heidelberg-New York. United Nations. 1989. Groundwater in Eastern, Central and Southern Africa: Zaire. United Nations Department of Technical Cooperation for Development, Natural Resources/Water Series No.19, ST/TCD/6. van Engelen VWP, Verdoodt A, Dijkshoorn JA and van Ranst E. 2006. 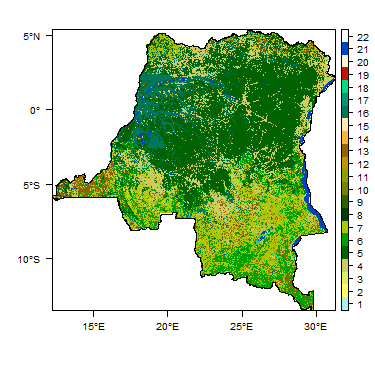 Soil and Terrain Database of Central Africa (DR of Congo, Burundi and Rwanda). Report 2006/07. Available through http://www.isric.org. ISRIC – World Soil Information, Wageningen). Waleffe. 1985. Esquisse hydrogéologique de la plaine de la basse Rusizi (Burundi). Mus. Roy. Afr. Centr., Tervuren (Belg. ), Dept. Geol. Min., Rapp. Ann. 1983 - 1984, pp 177-187. PROMINES - Growth with Governance in the Mineral Sector / La Bonne Gouvernance dans le Secteur Minier comme Facteur de Croissance. Project P106982 / IDA – H589 ZR – TF010744. This page was last modified on 11 March 2019, at 14:49.